Yet another one of our weekends has just passsed us by and what a weekend it was!! Friday nights party had a Neon Theme to it and the ballroom looked amazing, bright colours and glow everywhere. During the night we danced to all our favourite tracks (with a quick little sneaky teach of Boogaloo By Maggie G & Gary O'Riley). We had a Golden Oldie Hour, dancing our favourite classic dances from the past. As awlays a game of Irish Bingo was to be had and congratulations to Marilyn from Bournemouth on bagging that one! Also how could the night go by without having a quiz!! Congratulations to Lynne's girls from Minchinhampton & Chalford on winning that one. We managed to dance until 1am before calling it a night and headed of to bed to re-charge our batteries. Those Russians By Niels Poulsen - A great 64 count Easy Intermediate dance with a few Bridges and Tags and of course a happy ending to think about!!! Danced to a classic Boney M Track. I'll Be Alright - Another great dance from Maggie G (Have I mention we have her coming on the 15th May to Berkeley??) A 64 count dance to a track By Bekae Shae. A great catchy tune to dance along to and with 2 re-starts and a tag, it keeps us on our toes. From The Ground Up By Rob Fowler & Rachael McEneny-White. I know a few peeps do not like a waltz BUT there is nothing to not like about this one!! Its to a lovely track and has some nice step sequences in it. It's a little bit on the challenging side at 96 count advanced level BUT soooooo worth a go. We all then had some free time to go and enjoy the lovely weather we had and explore the surrounding areas. With being only 12 miles from Torquay and 12 miles from Exeter and right by a train line there is so much to do!! Party Night!!! A social with a Roaring 20's Theme. As always you all looked amazing and make a great effort in the dressing up and getting into the spirit of it all. 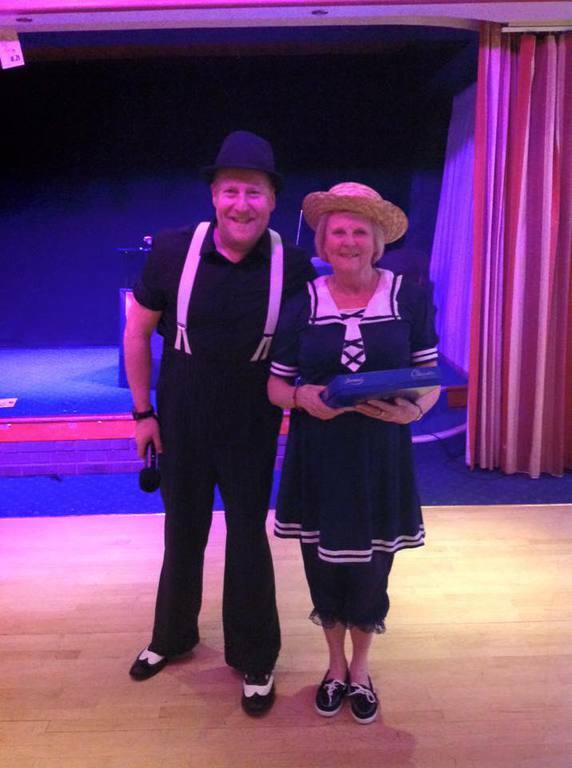 Congratulations to Sally & Mike Brown, Linda & Jim Milne, Sue & Alan Bartlett, Dipti Sarkar on winning the 20's themed quiz. Plus during the night we had a fabulous performance by Johnny O, showing us his Pole dancing and Burlesque skills. I think you would all agree with me in saying that it was a real treat!!! Even all the hotel staff came to watch that one! On went the dancing right up until 1:30am ..... Bed Time. Shouldn't Be That Hard By Neville & Julie - A dance to a Olly Murs track of the same name ... who doesn't like a bit of Olly Murs?? It's a 48 count dance with only 1 easy restart. Feels a little bit like the dance A Little Bit Gypsy, nothing to complicated and is a great dance. The weekend came and gone and in my opinion to fast and finished at 1pm. YOU - The Dancers - You continue to support the weekends away and you sure know how to party! You are a lovely bunch of peeps and I love spending time with you all and making such great memories. LYNNE WILLIAMS - My Partner in crime!! Thank you for all your help from teaching the fabulous Waltz that everyone loved to DJing and everything inbetween. Your amazing! JOHNNY - You are the social butterfly!! Making sure everyone is happy, dishing out the sweets, quiz papers, selling Bingo tickets, making sure the tea/coffee is ready, plus a massive thank you for your show on Saturday Night. PHOTOGRAPHERS - With our resident photographer not being on this weekend (Julie Rudge!) Lot's of peeps stood in to capture some great moments. A special Thank you to Mike Brown & Lynne Cobern. Now ....... if you have just read all of the above and have not yet been on one of our weekends away ....... why not??? You can see that there is something in it for everyone!! The November Weekend away is starting to get full, so if you are thinking about it, don't leave it to late and book today!! Details on the weekends away are under the Holidays tab.